Spoilers for The Flash included. In the last episode of The Flash, Barry and the gang learned a shocking revelation: the identity of Zoom is none other than Jay Garrick. (Honestly, how did I not see this coming? I have failed this fandom.) Now Barry is determined to stop Zoom once and for all. But in order to learn to run faster, he has to run backwards... to the past! The Wests meet at home for dinner. Joe and Iris reassure Barry that nothing related to Jay or Zoom is his fault; nobody could have predicted that could happen. (Only a number of Flash fans posting on the Internet.) While Joe grabs the food, Iris tells Barry about her date with Scott. She says it doesn't feel right because it reminds her too much of Eddie. (Poor Iris.) Barry encourages her to move forward. Wally shows up and tells them about his new project. He's reading up on old journals of inventors to help push speed limits or something. (You know, science.) But this gives Barry an idea. He decides in order to get faster he has to learn from someone who was able to manipulate the speed equation. That someone would be none other than Harrison Wells, or Eobard Thawne. He wants to travel back in time to last year and get him to teach him to run faster. Harry is completely against the idea, mentioning that it will alter the timeline, that Wells will know that Barry isn't who he says he is. But Barry points out that if he doesn't stop Zoom, it won't matter anyways--nobody will be safe. So Cisco and Caitlin help him pick a specific time frame from last year to travel to. Barry time travels, but in the time vortex a creepy Dementor thing comes at him and messes up his travel. He arrives a little too early in the timeline. His past self is facing off against the Piped Piper, Hartley Rathaway. (You know, the guy with the crazy gauntlets that let off that awful frequency.) Barry grabs his past self and tries to knock him out, but it doesn't work exactly as planned. He has to chase his past self down and inject him; it's kind of a really cool moment in the episode with the lightning speed zipping all over. But he manages to knock his past self out and switch the lightning bolt logo. He then stops Hartley (which is not what happens originally) and takes him to STAR Labs. At STAR Labs, he asks Wells about the speed equation. Wells obviously knows something is up with Barry, but he does help him out. At the same time, Eddie is still alive (Oh...), and Joe asks him to help out with investigating Wells. But before they can leave, the creepy Dementor attacks the CCPD building. STAR Labs gets an alert, and Barry tries to brush it off as nothing. Wells urges him to go help out, so he does. But by the time he gets to the CCPD, the Dementor has vanished, and he sees Eddie. Barry: Go on. Kill me, Thawne. See how this all ends. Meanwhile, Cisco confronts Hartley about his special gauntlets. But then the Time-wraith shows up and chases Caitlin. (Oh no!) The three of them hide in Hartley's cell, hoping that will stop the wraith. But it doesn't; it starts cracking through the glass. They call for Barry, but they can't find him. Hartley reprograms his gauntlets to match the wraith's frequency, which scares it off. By the time Barry and Wells show up, the wraith is gone. However, this gets Cisco and Caitlin thinking, and they realize that Barry is the common denominator for the wraith's appearances. Wells tells Barry there is no way to stop a wraith; speedsters (yes, plural, as in there are more out there) just try to avoid them when they time travel. 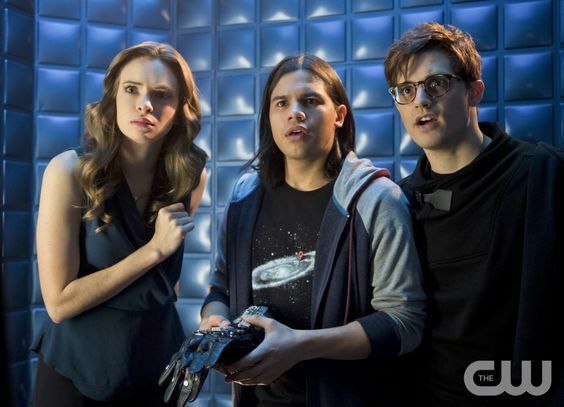 Cisco: "Wait a second, how do we know which one's the real Barry?" Past Barry: "Dude, okay, I've watched Wrath of Khan with you like five times." Future Barry: "Yeah, and every time at the end, you turn to me and say, 'I have been and always shall be your friend.'" Cisco: "Haha! You impostor! What is going on here?" They determine the only way to stop the wraith is for future Barry to return to the future. Wells takes Barry back into his super secret room (though, not handcuffed this time). He gives Barry a flash drive thing that supposedly has information on it about increasing his speed. Barry isn't completely happy with this compromise because he's worried Wells is playing him. But it's the only thing they have time for. Future Barry prepares to leave in order to lure the Time-wraith away from Wells and the past. He tells Team Flash they have a year to figure out how to stop the wraith, and he tells Cisco that Hartley knows where Ronnie is. (Since that bit changed when he captured Hartley early.) Barry runs, letting the Time-wraith chase him, but it slows him down so he can't time-travel. Past Barry, despite Wells' protests, runs to his aid and boosts future Barry into the time vortex. Barry tells them about the trip. They go to the secret room and put the flash drive into the computer device. But it doesn't do anything. Frustrated, Barry pounds his fist on the device. A blue hologram flickers to life above them, showing numbers and equations. They have a way to increase Barry's speed! Barry: Sometimes the only way to move forward is to revisit the things in your past that were holding you back. You have to deal with them head on, no matter how scary they may be. Because once we do, you'll see that you can go further than you ever imagined. What did you think of "Flash Back?"